Introduction: The acceptable noise level (ANL) measure is a subjective way of identifying how much of noise a person is able to put up with while listening to speech. Individuals with low ANL were observed to be satisfied hearing users than the individuals with high ANL. However, the reason for large individual variations of the measure is still not well understood. Exposure to noise may be one such factor that would affect the ANL which was never explored. Among the individuals who are exposed to noise, majority are exposed to occupational noise. Traffic police is such a working population who is exposed continuously to traffic noise during their duty hours. Hence, the present study was planned to investigate ANL measures in traffic police officers that might further provide insight toward the heterogeneity of the measure. 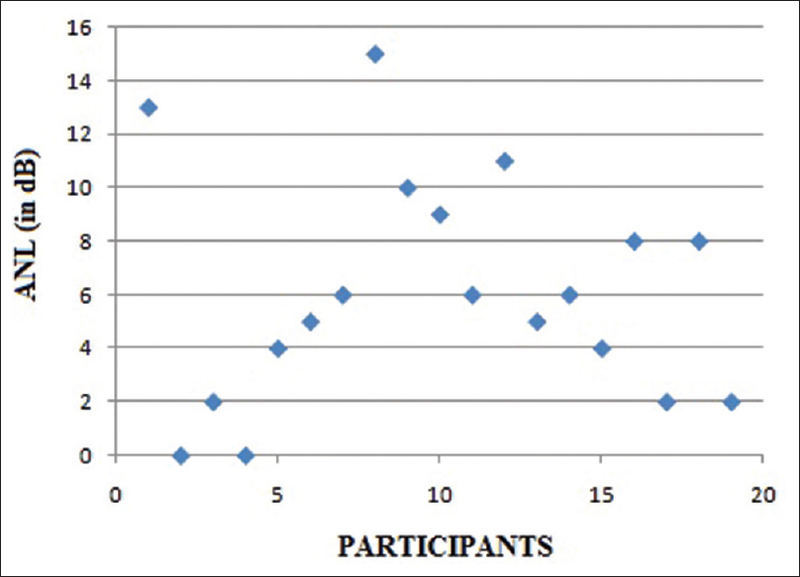 Methods: A total of 38 participants were divided into two groups. Group 1 consisted of 19 traffic police officers with minimum of 5 years of job experience and Group 2 consisted of normal hearing individuals without any noise exposure. All the participants underwent routine audiological evaluations followed by ANL testing. Results: The mean ANL obtained in both the groups was statistically compared. The results revealed that the traffic police officers yielded better ANLs than participants in Group 2. Conclusion: This ability of traffic police officers to put up with more noise while listening to speech may be attributed to their long-standing experience in listening to wanted signals in noise. Although many factors which would affect the ANL among individuals with normal and impaired hearing are being studied, the reason for large individual variations of the measure is still not well understood. Exposure to noise may be one such factor that would affect the ANL as it is shown to source various auditory and nonauditory effects including subtle auditory processing deficits, which was never explored. Among the individuals who are exposed to noise, majority are exposed to occupational noise. Occupational noise is well known for its nonauditory and auditory effects. The nonauditory effects of noise include sleep disturbances, annoyance, cardiovascular disease, and cognitive deficits. Occupational noise also results in outer hair cell dysfunction within the cochlea leading to cochlear hearing loss. However, these effects may be temporary as in temporary threshold shift or permanent as in permanent threshold shift. Moreover, occupational noise has also been reported to alter the temporal processing abilities of an individual which plays a crucial role in voice identification, pitch, and speech perception. Traffic noise is considered to be one of the main sources of environmental noise around us. Earlier researchers have reported the nonauditory effect of continuous long-term exposure to traffic noise. This includes sleep disturbance, annoyance, hormonal imbalance, and psychological stress. Traffic police is such a working population who is exposed continuously to traffic noise during their duty hours. They work in the midst of traffic noise throughout their duty hours. However, there were few studies carried out on them to understand the ill effects of traffic noise on their health. These investigators reported that the traffic police officers who work outdoors are at higher risk for nasopharyngitis, arthropathy, photosensitive dermatitis, heat stroke, and noise-induced hearing loss than the officers who work indoors., However, the subtle auditory processing abilities of such individuals who are exposed to traffic noise are not well understood. Moreover, there is a lack of literature on their efficacy to understand speech in the presence of background noise. Hence, the present study was planned to investigate ANL measures in traffic police officers that might further provide insight toward the heterogeneity of the measure. The aim of the current study was thus to investigate the ANL measure in traffic police officers who are exposed to continuous traffic noise. The objective of the study was to investigate whether the exposure to traffic noise results in variation of ANL in traffic police officers. The present study is a standard group comparison. The study was conducted in the city limits of Mysuru, India. The methodology adopted was reviewed and approved by the research review board of the institution. Traffic police officers from two different police stations were considered for the study as they recruit the officers to peak points where there is maximum number of vehicle movement in the city. All the participants were recruited on a nonpayment basis and provided written informed consent. The study considered two groups. Group 1 comprised 19 traffic police officers with at least 5 years of experience without any hearing loss or otological concerns and Group 2 with normal hearing individuals without any noise exposure and otological complaints. The age range was limited to 50 years to avoid the influence of age-linked hearing-related issues. Fifty traffic police officers with 5 years of job experience in traffic were considered for the study. Among them, six officers who were beyond 50 years of age were omitted. Five of them had middle ear dysfunction as evident from immittance evaluation and they were also not considered for the ANL experiment. Twenty traffic police officers were further selected randomly from the list for ANL evaluation and considered as Group 1. However, one officer could not complete the evaluation restricting the participants in Group 1 (19). The age range of the participants in Group 1 was 36–50 years, with a mean age of 47.53 years. Group 2 also consisted of 19 individuals with normal hearing and no associated otological problem or any noise exposure and served as control group. All the participants in Group 2 were also randomly selected. All of them were within in the age range of 20–50 years, with a mean age of 38.95 years. The subject selection procedure in Group 1 is given in [Figure 1] and in Group 2 is given in [Figure 2]. All the participants in both the groups underwent pure-tone audiometry and immittance evaluation to rule out any hearing loss and middle ear disorders using an Inventis Piano audiometer coupled with a calibrated Sennheiser HD 300 headphone and Inventis Clarinet immittance meter. Further, participants underwent ANL testing in sound-treated audiometric rooms with ambient noise within permissible limits. Stimulus and noise for ANL measurement were presented in a custom application through Matlab. 7.0. A calibrated headphone was used to present stimulus and noise binaurally to each participant. Stimulus used for ANL measurement was a Kannada story, and the background noise was speech babble. For ANL measurement, the procedure given by Nabelek et al. was followed. Most comfortable level (MCL) and the background noise level (BNL) were established initially to determine the ANL in each of the participants. To establish the MCL, the participants were asked to listen to a story through headphones. The level of the stimulus was 0 dB HL at the beginning. This level was gradually increased 10-dB steps until it became “too loud” for the listener. Further, the level of the running story was decreased in 10-dB steps until it was indicated to be “too soft” by each of the listeners. One this is done, the level of the story was further adjusted in 5-dB steps till the loudness became most comfortable for the listener. This level is considered as the MCL of the participant and was used for ANL computation. To establish the BNL, speech stimuli were presented at the MCL of the individual along with added background noise. The intensity of the background noise was kept at 0 dB at the beginning of the trial. This level of background noise was then increased in 5-dB steps. The listeners were instructed to indicate when the loudness of background noise becomes “too loud.” From that level, the intensity of noise was reduced in 5-dB steps until it was perceived as “too soft” by the individual. Noise level was further adjusted in 1-dB steps until it reached the maximum level that can be accepted by the participant while listening to the running story without getting tired or tensed. This particular maximum level of background noise is considered as BNL of the participant. MCL and BNL were used to estimate the ANL of the individual using the following formula: ANL = MCL − BNL. 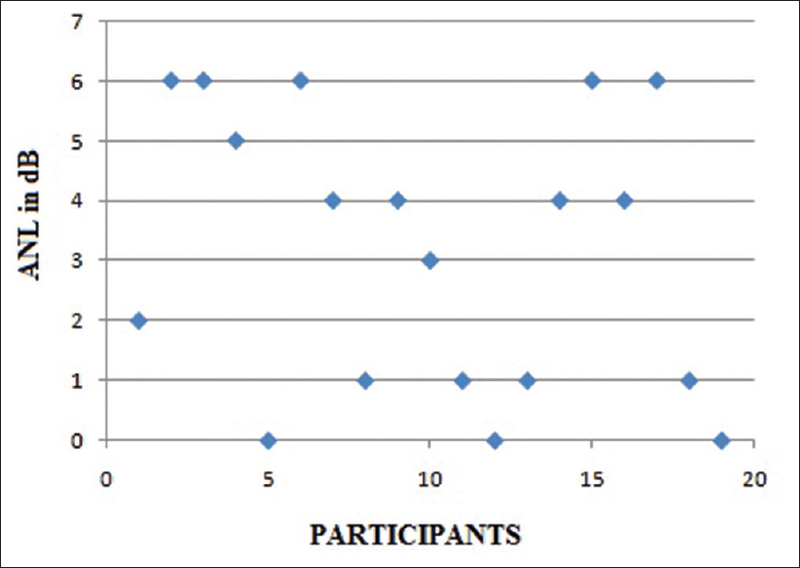 Thus, by subtracting BNL from MCL, the ANL of each of the participant was calculated and tabulated for further analyses. All the statistical analyses were carried out in SPSS 16.0 software (IBM corporation, Chicago, USA). The significance level for the study was determined to be 5%. Data obtained were subjected to statistical analyses. Descriptive statistics were carried out to obtain the mean and standard deviation (SD) of ANL obtained in both the groups. The mean and SD of ANL obtained in both the groups are given in [Table 1]. [Figure 3] depicts the scattered plot of individual ANL obtained in Group 1, and [Figure 4] depicts the scattered plot of individual ANL obtained in Group 2. The comparison of mean ANL obtained in both the groups is showed in [Figure 5]. From [Figure 4], it is evident that the mean ANL in traffic police officers is better (lower) than the mean ANL obtained from their counterparts without any noise exposure. However, the data were subjected to statistical comparison to check for its statistical significance. Shapiro–Wilk test was carried out to initially check for the normal distribution of the data. The results revealed that the ANL data obtained from traffic police officers (Group 1) did not follow normal distribution while the data from the Group 2 followed normalcy pattern. Hence, nonparametric statistical analysis was carried out further for statistically comparing the ANL obtained in both the groups. Mann–Whitney U-test was carried out for this comparison, and the results revealed that the mean ANL score was significantly lower in traffic police officers in comparison to Group 2 (U = 104, P < 0.05). However, a previous study has reported that the fine temporal resolution abilities in traffic police officers are not compromised. The authors attributed this to various properties of the noise to which the traffic police officers are exposed to. The current study also observes that the ANL of traffic police officers was significantly lower than the control group. This suggests that they can put up with more noise while listening to speech. 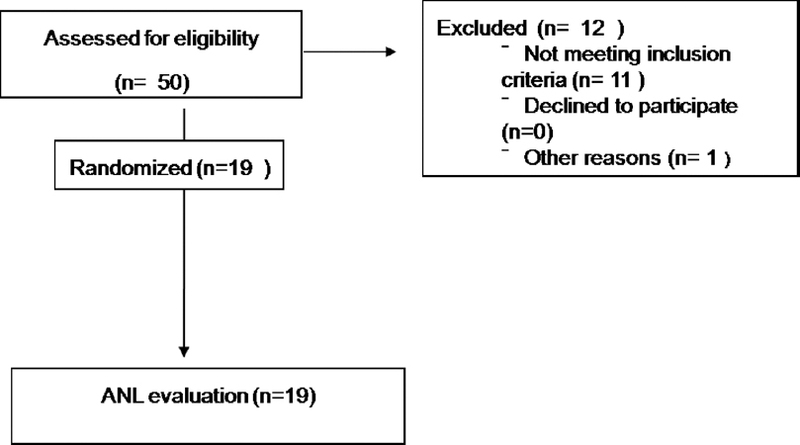 Although the effect of experience in listening in noise on ANL was never being investigated, it is already been reported that training provided using degraded speech including speech in noise improves an individual's speech perception abilities in noise. According to this study, invoking such high auditory demands would further strengthen the cortical processes which in turn improve the sensory acuity at brainstem level which improves speech perception in the presence of noise. Traffic police officers being a group that works under such noisy situation constantly are also under similar auditory demands during their duty hours. This extensive experience in listening to speech and other wanted signals in noise might have made their auditory system much sturdier to noise, thus improving their speech perception abilities in noise. This, however, has to be substantiated in other populations who work in noisy environment with different subjective and objective measures. The current study was planned to evaluate the effect of exposure to noise and experience in noise on ANL. A group of traffic police officers who are exposed continuously to traffic noise for at least 5 years were studied. The results suggested that the ANL were significantly better in them in comparison to a group who are not exposed to continuous noise. This ability of traffic police officers to put up with more noise while listening to speech may be attributed to their long-standing experience in listening to wanted signals in noise. The present study may be extended to other populations who work in noise with different subjective and objective measures to substantiate the findings. The authors acknowledge the Director, JSS Institute of Speech and Hearing, Mysore, for permitting us to carry out the study and to use the equipment and space in the department for the study and sincere gratitude to all the participants of the study also. Nabelek AK, Freyaldenhoven MC, Tampas JW, Burchfiel SB, Muenchen RA. Acceptable noise level as a predictor of hearing aid use. J Am Acad Audiol 2006;17:626-39. Ahlstrom JB, Horwitz AR, Dubno JR. Spatial benefit of bilateral hearing AIDS. Ear Hear 2009;30:203-18. Gordon-Hickey S, Moore RE. Influence of music and music preference on acceptable noise levels in listeners with normal hearing. J Am Acad Audiol 2007;18:417-27. Nabelek AK, Tucker FM, Letowski TR. Toleration of background noises: Relationship with patterns of hearing aid use by elderly persons. J Speech Hear Res 1991;34:679-85. Plyler PN, Alworth LN, Rossini TP, Mapes KE. Effects of speech signal content and speaker gender on acceptance of noise in listeners with normal hearing. Int J Audiol 2011;50:243-8. Rogers DS, Harkrider AW, Burchfield SB, Nabelek AK. The influence of listener's gender on the acceptance of background noise. J Am Acad Audiol 2003;14:372-82. Basner M, Babisch W, Davis A, Brink M, Clark C, Janssen S, et al. Auditory and non-auditory effects of noise on health. Lancet 2014;383:1325-32. Kumar UA, Ameenudin S, Sangamanatha AV. Temporal and speech processing skills in normal hearing individuals exposed to occupational noise. Noise Health 2012;14:100-5. Diaz J, Ekelund M, Gothe R. Traffic Noise Pollution - A State of the Art Review. A Project Supported by The European Commission, D G Health and Consumer Protection, Luxembourg Within the Program Pollution Related Diseases; 2001. Li YC, Huang HJ, Zhang ZL, Qi XY. 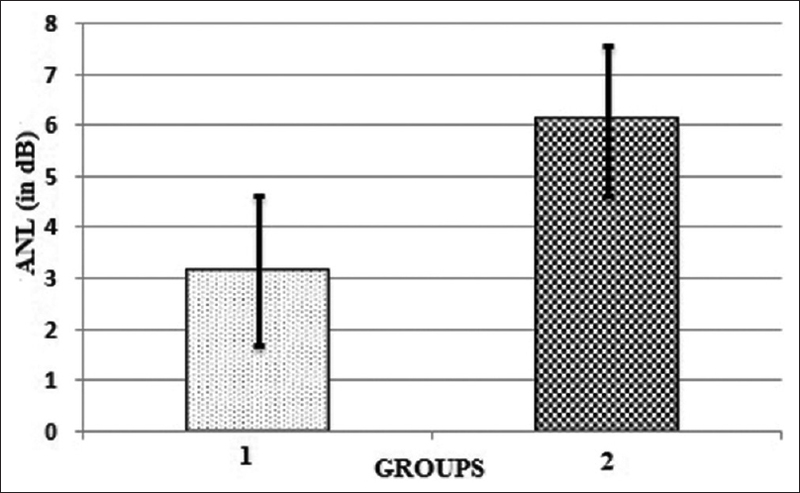 Effects of occupation on health of traffic policemen in a city. Zhonghua Lao Dong Wei Sheng Zhi Ye Bing Za Zhi 2008;26:165-7. Lesage FX, Jovenin N, Deschamps F, Vincent S. Noise-induced hearing loss in French police officers. Occup Med (Lond) 2009;59:483-6. ANSI. American National Standard: Maximum Permissible Ambient Noise Levels for Audiometric Test Rooms. New York: American National Standards Institute, Inc., ANSI; 1999. p. S3. Nabelek AK, Tampas JW, Burchfield SB. Comparison of speech perception in background noise with acceptance of background noise in aided and unaided conditions. J Speech Lang Hear Res 2004;47:1001-11. Spoorthi ML, Sharmada K, Vikas MD. Effect of Long Term Exposure to Class Room Noise on Temporal Resolution and Speech Perception Abilities. Manipal, Karnataka, India: Proceedings of 47th Indian Speech and Hearing Association Conference; 2015. Vipin G, Sharmada K, Meera RA. Effect of long-term exposure to traffic noise on auditory temporal resolution of traffic police: A preliminary study. J Hear Sci 2016;6:50-4. Song JH, Skoe E, Banai K, Kraus N. Training to improve hearing speech in noise: Biological mechanisms. Cereb Corte×2012;22:1180-90.